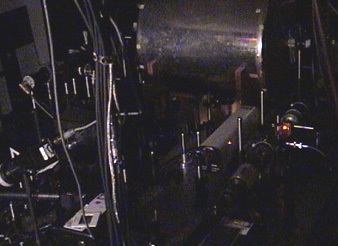 Harvard-Smithsonian laser apparatus used to store photon "signal" for fraction of a second in small glass cell filled with rubidium gas. February 2001 photograph courtesy physicists Ron Walsworth and David Phillips. February 27, 2001 Cambridge, Massachusetts - A revolutionary step in physics was reported around the world on January 18, 2001 when The New York Times headlined "Scientists Bring Light to Full Stop, Hold It,Then Send It on Its Way." The scientists are actually two independent teams of physicists who both managed to slow photons down. One group is led by Lene Vestergaard Hau, Ph.D. of Harvard University and the Rowland Institute for Science in Cambridge, Mass. The second group was lead by Ronald L. Walsworth, Ph.D., and Mikhail D. Lukin, Ph.D. of the Harvard-Smithsonian Center for Astrophysics, also in Cambridge, with colleagues Dr. David Phillips, Annet Fleischhauer and Dr. Alois Mair.